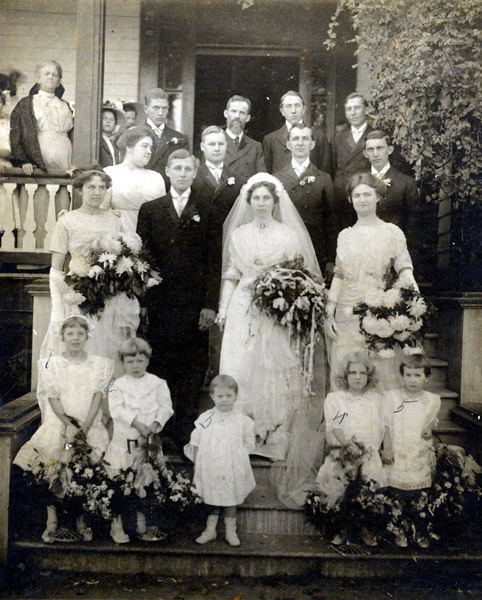 Comments: Charles R. Dorrier and Clara Lee Pitts of Scottsville gathered for a wedding photo with family and friends on Belle Haven's front steps. Charles was the son of William and Catherine Ann (Ritchey) Dorrier, who owned and operated Mt. Pleasant Farm near Scottsville. Clara Lee was the daughter of Captain John Lee Pitts and his first wife, Florence Lindsay (Burgess) Pitts, of Scottsville. Charles and Clara Dorrier first lived at The Cottage on Belle Haven's grounds; later they built Hill Top on James River Road. Use the image below as a guide to the names of the C.R. Dorrier's wedding party. (1) Kathleen Colley, daughter of Laura (Burgess) Colley. Kathleen was the niece of William E. Burgess. (2) Edward Dorrier, son of Walter S. and Cornelia (Burgess) Dorrier. Edward was also the nephew of William E. Burgess and the newlyweds, C.R. and Clara (Pitts) Dorrier. (4) Katherine Elizabeth Pitts (1907-1992), daughter of Captain John Lee Pitts and Helen Amanda (Burgess) Pitts. (5) Stella Crisp Pitts (1907-1988), daughter of David Henry Pitts and Stella (Crisp) Pitts. (7) Charles Richard Dorrier (1885-1966) owned and operated C.R. Dorrier and Company, a general store at the south corner of West Main and Valley Street in Scottsville for fifty years. He also served for a period of time as Chairman, Albemarle School Board, and as a member of the Ablemarle Board of Supervisors, Masonic Lodge, and numerous business and social organizations. (8) Clara Lee (Pitts) Dorrier (1889-1951) was out-going in nature, active in the Scottsville Methodist Church, and a busy mother. 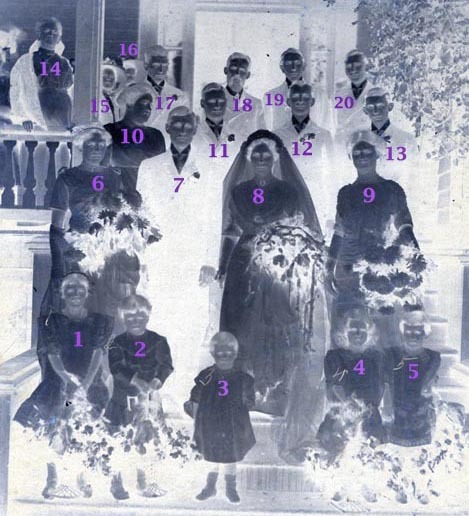 The C. R. Dorriers became the parents of five children: Charles Richard Dorrier, Jr. (1913-1985); Sarah Elizabeth Dorrier (1915-1986); John Lee Dorrier (1917- ); Lindsay Gordon Dorrier; and James Lee Dorrier (1921- ). (11) Benjamin Dorrier, brother of C.R. Dorrier and later married Miss Conklin. (12) Walter S. Dorrier, brother of C.R. Dorrier and later also became the President of Scottsville National Bank. Walter married Cornelia Burgess, a sister of William E. Burgess. (13) Arthur Marion Pitts (1887-1932), brother of Clara Lee (Pitts) Dorrier, who married Julie E. Holliday on October 12, 1910. Marion worked in railroad construction with his father, Captain John Lee Pitts. Marion's mother was Florence Lindsay (Burgess) Pitts, sister of William E. Burgess. (17) Floyd Lindsay Pitts (1894-1962), who married first Martha G. Dillard on Feb 20. 1918, and secondly, Hester McFarlane on June 2, 1921. Lindsay also worked in railroad construction with his father, Captain John Lee Pitts, and Marion, his brother. Lindsay's mother was Florence Lindsay (Burgess) Pitts, sister of William E. Burgess. (18) Rev. Browne, minister of the Scottsville Methodist Church. (19) John Lee Pitts, Jr. (1894-1984), brother of Clara Lee (Pitts) Dorrier, who graduated from VMI, served in World War I, and later became an executive of General Motors Corp. John was the son of Captain John Lee and Florence Lindsay (Burgess) Pitts, Sr.
(20) James F. Dorrier, brother of C.R. Dorrier, who later married Sarah Carrington.